LONDON.- This afternoon in Sotheby’s English Literature, History, Children’s Books & Illustrations sale, a previously unknown gold and gem set ring belonging to the great English author Jane Austen, sold for £152,450 – more than five times its pre-sale high estimate of £20,000-30,000. Eight bidders battled for the turquoise ring, which was eventually won by an anonymous private collector over the telephone. 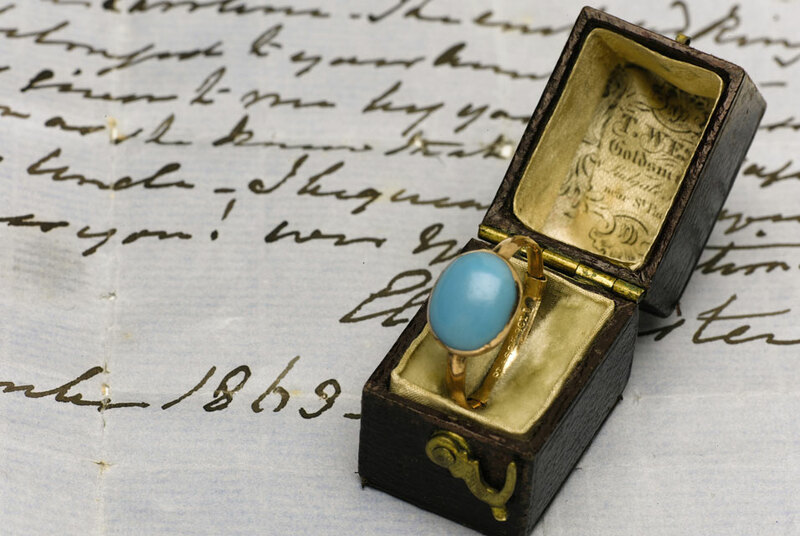 The ring was offered for sale for the first time, having remained in Jane Austen’s family for nearly 200 years – handed down between female descendants over many generations. US singer Kelly Clarkson has been foiled in her attempt to take home a ring once owned by Jane Austen, after a British museum said Monday it had raised enough money to buy it back. The 31-year-old singer bought the ring at an auction last year, but the British government blocked her from taking it out of Britain while attempts were made to raise funds to “save it for the nation”. The ring, one of only three surviving pieces of jewellery known to have belonged to the celebrated novelist, is due to go on display at the museum early next year. Known for their gentle mocking of the landed gentry, Austen's novels including “Pride and Prejudice” and “Emma” are among Britain's best-loved classics.